← Which Country Produces The Very Best Pointe Shoes? Do Satin Wrinkles Really Matter? I popped over to the Gaynor Minden website on my sidebar the other day and noticed something new. 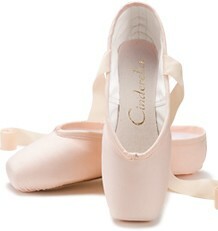 Gaynor Minden has come out with a new pointe shoe called the Luxe model. The shoe itself is still the same great design as far as construction. The new part is the satin exterior. 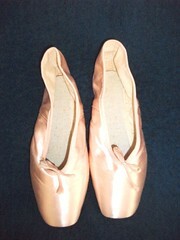 This particular satin is supposed to be smoother and produce a more wrinkle-free appearance than normal pointe shoes. 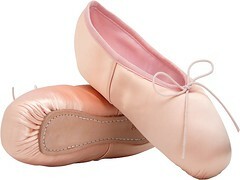 Has ballet really come so far as to demand perfection and aesthetics from the satin that covers a dancers pointe shoe? What is unclear about the Luxe model is whether it is intended as a modeling shoe for pictures, or whether a dancer can go ahead and use them regularly and still expect no wrinkles from her shoes on pointe. 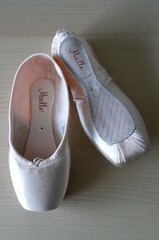 There must be a real demand for a pointe shoe that has thicker, smoother satin that photographs well. 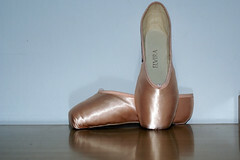 Some very choosy dancers probably noticed the way that typical satin bunches up when arching the feet and didn’t like the way it looked. 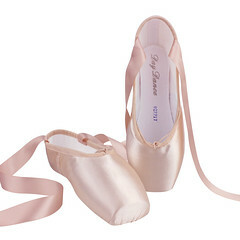 I will have to check out some of the reviews about this new satin after a while and see what the consensus is online among dancers who wear Gaynor Minden pointe shoes. 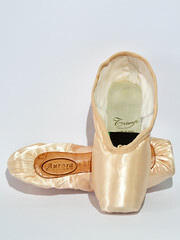 This entry was posted in Ballet Writing and tagged Gaynor Minden Luxe pointe shoe, Luxe pointe shoe review, pointe shoe satin, pointe shoes that dont wrinkle. Bookmark the permalink.